January 2, 1932 – Well, the work on the long-awaited bridge across the Chicago River on the lakefront drive is off once again. Edward J. Kelly, president of the south park board, calls a meeting with the heads of the south park and Lincoln park boards, along with members of the Chicago Plan Commission and the contractors involved in the link bridge project. It is decided that until the park boards receive the necessary revenue, the work is off. Mr. Kelly says, “We must conserve our cash in the present tangled financial situation. 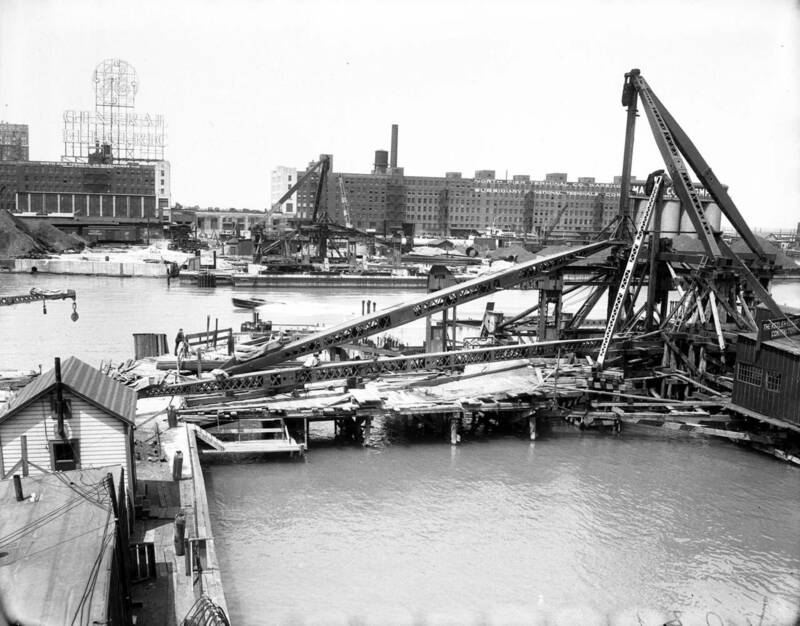 All construction programs … excluding only the island for the world’s fair, must be dropped if we are to live within revenue and meet obligations.” Work on the approaches to the bridge had begun in 1929, and work on the bridge itself was started on June 6 of 1932. The city has cried out for this connection between north and south, a project that was proposed as early as 1909. The bridge would finally be dedicated in October of 1937. The photo above shows where the project stood at the time.